We now return you to your regularly scheduled fluff programming. After months of waiting for the Strata Council to get their heads out of their collective arses, my landlord has finally been able to get going with a complete renovation of my bathroom. So far it’s been kinda cool. I get up in the morning and go to work. At some point during the day, contractors show up, and do things. I get home, and stuff is different. When I got home last night, my bathroom had gone from looking like a somewhat run-down bathroom to looking like a Gitmo prison cell. Had I known that, I’d have put up an ad with the local fetish community, and rented it out for a few hours for people to act out their torture fantasies. I’m not sure what it’ll look like when I get home today, though I’m anticipating tile flooring and a bathtub might be in. In the meantime, I’m showering at the Spelunking club, and have made arrangements with a few friends in case that ceases to be adequate. You can follow the progress at the flickr set I’ve created here. And if I show up at Northern Voice looking a little scruffy and worse for wear, you’ll know they didn’t finish in time. is the spelunking club in a building or a cave? i hope for your sake it’s the former. Wow, for a second there i thought you’d stole the photos for my bathroom renovations! 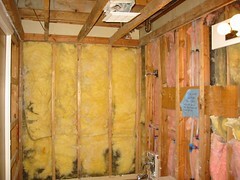 Although i’m weirded out that they didn’t remove all the drywall from the walls. Just seems odd to leave one wall with drywall. Ah well, good luck and keep us up to date.